With aircraft already having been used to transport fi eld post during the First World War, 1918 marks the start of civilian airmail. 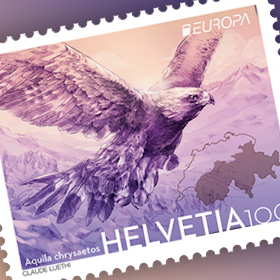 Austrian Post is celebrating this special anniversary with a mini sheet of commemorative stamps. Trial fl ights were carried out between Vienna and Lviv (in the Ukraine) at the end of March 1918 and, as these were successful, the first daily international civilian air courier service between Vienna and the Ukraine went into operation on 31st March 1918. 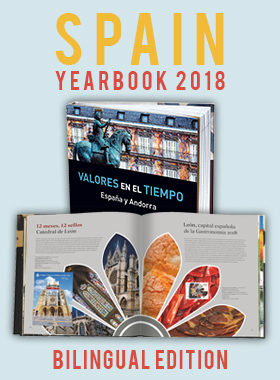 The route ran from the Aspern airfield in Vienna via Krakow to Lviv, from the end of June also continuing on to Proskuriv and ultimately Kiev, a distance of 1,200 kilometres each way. The flight from Vienna to Lviv, including an interim stop, took around three hours. In July 1918 a further flight connection between Vienna and Budapest was established, running twice a day. However, just a few weeks later, as a result of numerous complications and accidents, this airmail service was halted. The airmail service primarily used aircraft of Austro-Hungarian manufacture, such as the models produced by Hansa-Brandenburg. This aircraft manufacturer was a development of the Brandenburgischen Flugzeugwerke GmbH founded by the Austrian flight pioneer Igo Etrich. 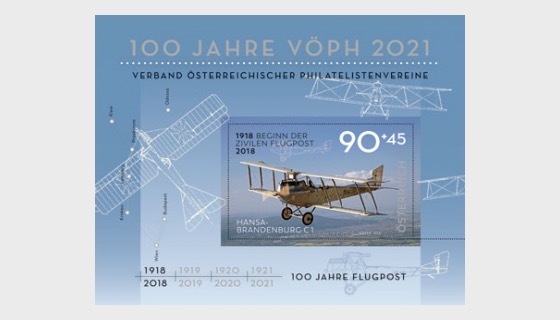 This mini sheet of commemorative stamps from the “100 Years of the VÖPh (Federation of Austrian PhilatelyAssociations)” series, which will run until the centenary in 2021, shows a historic Hansa-Brandenburg C1 aircraft and the route taken by the first air courier service. 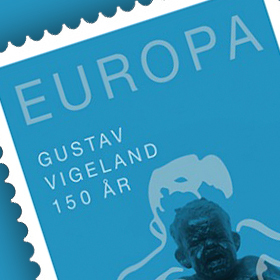 Airmail was franked by means of specially issued provisional airmail stamps, based on the postage stamps issued in 1918, in denominations of 1.50 Kronen, 2.50 Kronen and 4 Kronen with the blackimprint “Flugpost” (airmail). The airmail stamps were initially printed on grey “war paper”, and lateron white paper. The cost of transport comprised the postal fee (in postage stamps), commission of 1 Krone per delivery for transport to the airfield and a flight fee of 1.50 Kronen per 20 grammes for each section of the route. The last civilian airmail deliveries took place in October 1918; the airmail stamps ceased to be valid on 15th October 1918.